Solliquin is a behavioral health supplement made by Nutramax (Dasuquin, Cosequin, Denamarin). We at Evesham Veterinary Clinic are pleased to help introduce this treatment for behavioral problems. 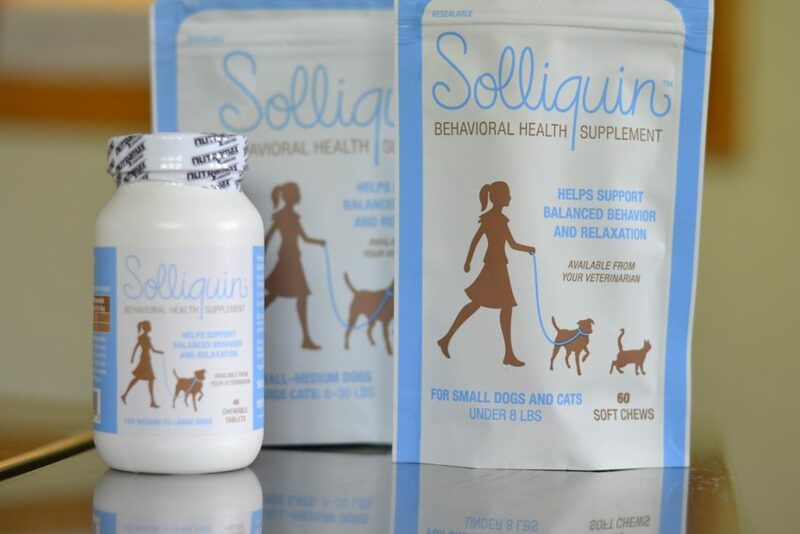 Solliquin’s combination of natural ingredients helps to reduce anxiety in dogs and cats. L-theanine: an amino acid found naturally in black, green, and white teas. Magnolia officinalis: an extract from the bark of the Magnolia tree. Phellodendron amurense: fruit and bark extracts from the Amur cork tree. Whey protein concentrate: a milk protein extract. Solliquin is available as tasty chewable tablets or soft chews. It reduces anxiety, without sedation. In combination with a behavior modification program it can be an effective treatment for separation anxiety, noise phobias, and other behavioral problems. It is available in several sizes: soft chews for small dogs and cats, soft chews for small-medium dogs and large cats, and tablets for medium-large dogs. If you think your dog or cat might benefit from Solliquin, please call us at (856) 983-9440.